Ancroft Place: Model Suite Almost Ready…..
Big news on the townhouse front today: the model suite for Canlight Realty’s Ancroft Place [map] is nearly complete. We’ll post more on this as it develops. According to Canlight, the other suites will be finished and available to view by September. 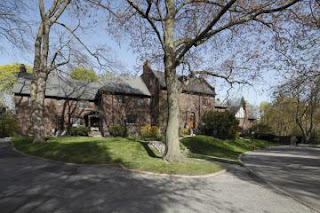 For those of you out of the loop on Rosedale housing market developments, Ancroft Place is a collection of 21 elegant brick town homes built in the 1920s. Although they were designated as a heritage site in 1973, Canlight has successfully restored the homes, giving home buyers the chance to own a classic piece of Rosedale real estate. The 3 to 4 bedroom + den homes have been updated with all the features and amenities one could ask for in a 21st century home, but the builder has skillfully retained the unique 1920s design and architectural characteristics in each house. It’s like stepping into a time machine but being able to bring your espresso machine and washer/dryer set along with you. Just hope that your time travel shenanigans won’t bring about any Back To The Future-esque paradoxes. For more information email vlord@sothebysrealty.ca or register on the Ancroft Place official website.